Is Computer-based Safety Training Effective? There are actually research studies behind the question of the effectiveness of computerized safety training. One study, entitled, 'Is computer-based instruction an effective way to present fire safety training to long-term care staff?,' found in the Journal of Nurses Staff Development is one article that notes that nurses do just as well with human or computer instruction on fire safety. Other studies say that computer safety training works as well, but also points out some negatives. Keep in mind is that no training is fool-proof. Also equally important to note is that a training program is only as good as the trainer, be it a person or software program. If the computer-based fire safety training or human trainer is smart, complete, and well thought out, individuals will likely learn from the training. Often less expensive than hiring a professional training staff for a company. Training can be done at any time - even the middle of the night. Computer based training always cover the same topics, in the same way. A human will vary a training each time they do it; maybe not drastically, but a computer program ensures that employees receive the same information each time. Some individuals zone out in a real classroom setting, but may learn better on a self-paced program. Tests associated with computer training can be quickly graded. If an employee is sick on training day, no worries because they can still take the training. Computer training almost always takes less time than human-taught trainings. Often computer training programs are very flexible, thus suitable to all sorts of people. For example, a program can be rewound, go faster, show pictures, only text, or include sound as well. Not everyone learns well this way. Not everyone is computer literate. Sometimes the person taking the training will have a question, but a computer can't always answer it. Because computer-based safety programs are gaining in popularity, many companies now produce them. You have to be careful to choose a good program, not simply a program quickly put out by a business looking to make money. A computer fire safety program can teach basics, but they are usually not set up to teach specifics that apply to your home, business, or school. A pro training team designs trainings that are totally applicable to your needs. Probably the biggest concern about computer-based fire safety training is that some fire training is much better taught in a hands-on manner. You can't, for example, practice with a fire extinguisher, try on fire safety suits, or stop-drop-and-roll on a computer. You also can't practice escape routes or locate building exits. Since all of the above should be part of any good fire safety program, this is a huge negative. A human training team can teach fire safety skills and all the hands-on techniques at the same time, which can drive the training home better than spreading out the hands-on sections with the textbook material. Plenty of companies and software manufactures offer safety training of all kinds, including fire safety. Before you choose a program, make a list of what you need it to teach. Is it for your family, a school, your place of business, handicapped individuals, or another group? Training needs differ wildly. If you jot down what you need, you can find a better software fit. Make sure that the training program you choose is correct and up to date. Anyone can make and sell a fire safety program, but is the information provided correct and useful? It is better be to keep everyone safe. Look at a company's credentials before choosing their program. For all you know, they may specialize in dog training videos and not have any fire know-how at all. National Safety Compliance, Inc: Offers various OSHA compliant CD-Roms such as Fire Prevention in the Office, Fire Extinguisher, and Industrial Fire Prevention. They also offer Flammables & Explosives in the Laboratory. TPC Training Systems: Offers a multitude of CD-Rom safety programs. Many are fire related, and you can watch clips online. 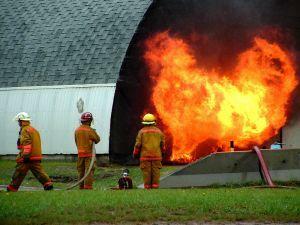 The Training Network offers multiple fire safety titles. If you are working with kids, you might also like to learn more about, Fire Safety Education Clip Art or Fire Safety Puzzles.